When I think about Ivy Manning's new book, I can't believe that I've been looking forward to seeing the final result since October of 2011. Time seems both to linger and fly in waves, and looking back over the amount of time that has passed since I first became acquainted with Ivy and was welcomed into cookbook testing with vigor seems oddly surreal. Ivy and I have never met; we were introduced online by another online friend who I have actually met in person, Deena Prichep. Last Thanksgiving, I looked forward to an evening dinner with Ivy as she visited her homeland of Wisconsin, but an unfortunate flu plagued her (and I was iffy about eating, being newly pregnant) and the opportunity slipped by, drowned under the weight of even more passing time. The good thing about this passing time is that I know Ivy and I will one day finally sit down to supper together, and when dark days hit, I think about this with great anticipation. While things on the personal finance front are finally looking up, my bookshelves could quickly grow heavy with new titles that are worth owning, and Ivy's newest book is definitely among them. Crackers & Dips: More than 50 Handmade Snacks is a DIY foodist's dream: and I should know, because I got to make and taste firsthand quite a lot of the contents. The books that usually find permanent residence in my house are the ones that I grab not only for inspiration, but because I know that the recipe will work on the first go - if I'm making it for the 20th time, or just last minute for company. The other necessary criteria for cookbook ownership is beautiful design, and this book is also beautifully photographed and illustrated, a unique combination of photography (by Jenifer Altman) and chalk drawings (by Kristina Urquhart). There might not be a better book suited for both gift-giving and practical use! Every recipe in this book is going to work for you, for snacking, appeasing the kiddos, gift giving, or party-going. 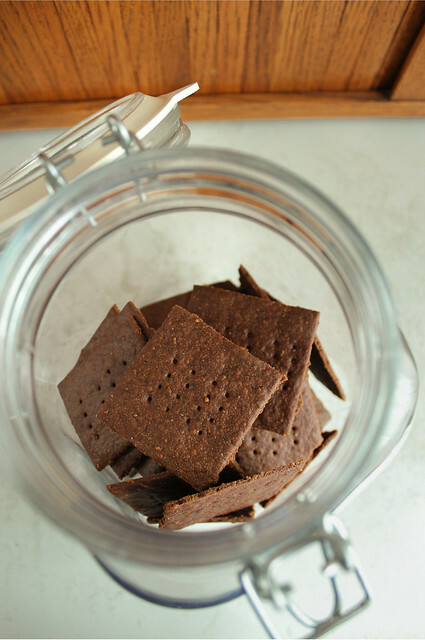 I decided that to celebrate the release of this book, I'd make one of the crackers that I didn't get a chance to test: the Skinny Mint Chocolate Grahams. Billed as a dessert cracker, these would remind you of a much tastier version of the classic Girl Scout classic. And after reading this article on the suspect ingredients in them, I feel all that much better to have a really good DIY version! I love baking by weight, since it is much faster than measuring all the ingredients traditionally, and is more consistent. This book has metric weights for all of the ingredients listed. I know that when doing my portion of the testing, I double checked the volume to metric ratio, so even if you bake by volume, you can be assured of a good result. Preheat oven to 350 f. (180 c.). Line two baking sheets with silicone baking mats or parchment paper. In the bowl of an electric mixer or in a large bowl using a handheld mixer, beat the butter, sugar, honey, and peppermint extract together until fluffy, stopping occasionally to scrape down the sides of the bowl. Sift both flours, the cocoa powder, baking soda, and salt into a medium bowl. Add the dry ingredients to the butter mixture and mix on low speed until the mixture forms moist crumbs; do not overmix. Gather up the dough with your hands (it will come together when squeezed), and divide the dough into two equal-size pieces. 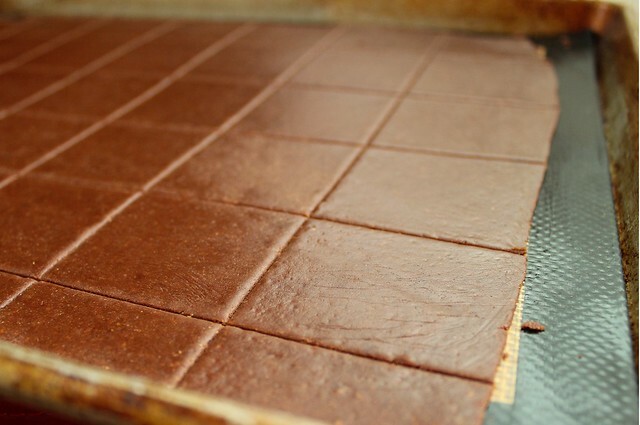 Form each piece of dough into a rectangle measuring 4x6 inches, cover in plastic wrap, and refrigerate for at least 30 minutes and up to 2 days. Place a piece of parchment paper on a work surface and lightly dust it with all-purpose flour. Place a portion of dough on the paper, dust it with flour and place a piece of plastic wrap over the dough. Roll the dough out until it is 1/8" thick, picking up the plastic once or twice to make sure there are no creases in the dough. Cut the dough into the desired shapes using cookie cutters, and use a lightly floured spatula or bench scraper to transfer the crackers to one of the prepared baking sheets; reserve and chill the scraps. 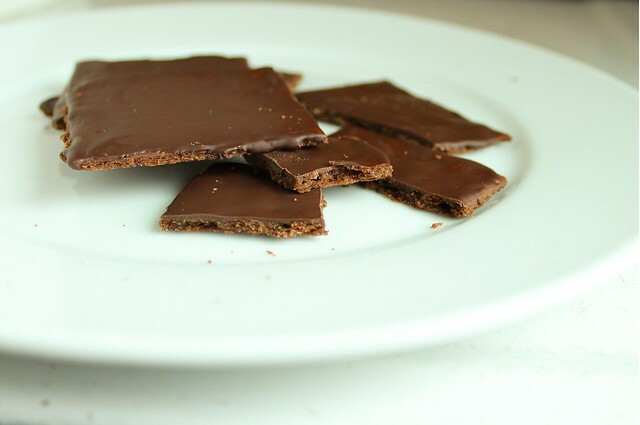 Prick each cracker a few times with a fork or comb and bake until they are crisp and smell chocolaty, 10-12 minutes, rotating the sheet once from front to back while baking. Transfer the crackers to a cooling rack. While the first batch of crackers is baking, repeat the rolling and cutting process with another ball of dough; the chilled scraps can be re-rolled once. In a small microwave-safe bowl or a double boiler, melt the chocolate chips until smooth. Remove from the heat and whisk in the canola oil. 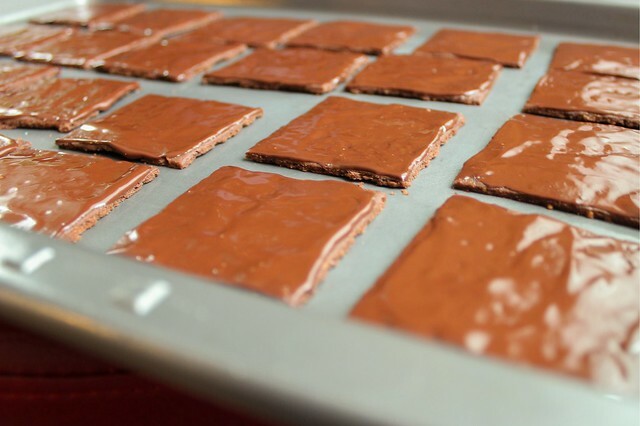 Using an offset spatula, spread about 1/2 t. of the melted chocolate mixture over each cracker and place them on a baking sheet. Refrigerate the graham crackers until the glaze is set, about 30 minutes. Once the glaze has set, store the crackers in an air-tight container in the refrigerator for up to 2 weeks. In my whole foods kitchen, I successfully substituted sucanat for the sugar, and olive oil for the canola. I also like to roll out the crackers directly on a silicone mat with a piece of plastic wrap over the top. I found that I didn't need to use any additional flour that way. I also cut the crackers into squares in part because I was a bit lazy, but also because there is less waste that way. And besides, that way I get to nibble every ragged edge of chocolate mint graham cracker myself. So now for the fun part: I was given a copy of this book to giveaway! This is the first giveaway that I've had that didn't contain something that I made myself (Pomegranate Jelly or Candied Jalapenos), or something that I bought to giveaway (WMSE Rockabilly Chili Cookbook). Historically, I am a small blog with a dedicated readership, so your chances to win this beautiful book are very good. I wouldn't mind if you share the post and the word about Crackers & Dips with your friends however, because I know they would appreciate a homemade batch of crackers too. To enter, just leave a comment below before midnight next Friday, May 17th. I'll choose a winner using a Random Number Generator on Saturday the 18th, and post it here and on the CakeWalk facebook page. I'll leave you with the image of my favorite recipe from the book: another dessert cracker made with rich olive oil, orange blossom water and aniseed. This recipe is alone is worth the cover price, especially when you consider that a gourmet, wax papered bag of pretty Ines Rosales crisps costs quite a bit in specialty food markets... and isn't it so much better to make it yourself anyway? Congratulations to Ivy Manning on a gorgeous accomplishment! Disclaimer: I did receive a copy of this book for review, and another to giveaway. My opinions of this book are my own, well deserved, and are not embellished!